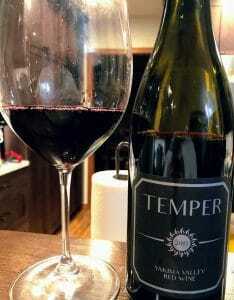 A few quick thoughts on the 2015 Temper red blend from Javier Alfonso of Pomum Cellars. Temper is a special project of Spanish-born winemaker Javier Alfonso. A native of Ribera de Duero, Javier and his wife Shylah started Pomum Cellars in 2004. Seeing the similarities in the continental climate of Eastern Washington to that of central Spain, Alfonso was fascinated at the potential for Spanish grapes in Washington. In addition to Pomum Cellars (which now focuses on French varietals) and Temper, Alfonso also produces wines under his Idilico label that highlights Spanish varietals. Alfonso works with several vineyards in the Columbia Valley including Dubrul, Konnowac and Dineen Vineyards in the Yakima Valley, Upland Vineyard on Snipes Mountain and Elerding Vineyards in both the Yakima Valley and Horse Heaven Hills. In 2003, Alfonso planted his own estate vineyard, AD Dunn, in the Yakima Valley near Zillah with Tempranillo and Merlot. The 2015 Temper red blend is majority Cabernet Sauvignon and Tempranillo with small amount of other Bordeaux and Spanish varietals. The wine is sourced completely from the Yakima Valley. Medium-plus intensity. A mix of red and dark fruits–cherries and currants–with some fresh tobacco and black pepper spiciness around the edges. Very intriguing bouquet that continues to evolve in the glass. Juicy red cherries and spice notes are a hallmark of this elegant wine. On the palate, mostly the red fruits carry through and are amplified by the medium-plus acidity. The spiciness also seems to jump up a notch with a smokey element that adds to the savoriness. The fresh tobacco moves to a cured flavor. The medium-plus tannins are firm, holding up the full-bodied weight of the fruit well. The long finish lingers with the spice notes. While this wine has ample fruit, the balanced hand of oak and impressive structure comes across as very Old World in style. The juicy savoriness and spice is tailor made for food pairing. At $25-30, this is a very solid and character driven red blend that is perfect for foodies. Tagged AD Dunn Vineyard, Cabernet Sauvignon, Columbia Valley, Dineen Vineyard, Dubrul Vineyard, Elerding Vineyards, Horse Heaven Hills, Idilico, Javier Alfonso, Konnowac Vineyard, Merlot, Pomum Cellars, Ribera de Duero, Temper, Tempranillo, Yakima Valley.